When you become an affiliate for a brand or company, you are provided with unique links to products that result in a commission when someone either clicks on the link or purchases the product. Explaining the different types of affiliate arrangements could take up a separate post, so for brevity, an affiliate link is one that results in a gain (usually monetary) for the person providing the link. For example, I sometimes use affiliate links in my Five Things Friday posts. When someone clicks on that link and purchases the product, I receive a small commission of that purchase. The price to that person is the same, regardless of if it is an affiliate link or not. If you want to read a book I recommend, for example, it will be the same price through my Amazon link or if you go to Amazon yourself and look it up. What Does “Cloaking” Your Affiliate Links Mean? You are taking a long, ugly, link and turning it into a prettier, shorter one. Some of you may be thinking that this is a good way to hide your affiliate links from your audience since some people are hesitant to interact with links that they know are affiliate. Before I get into the benefits of cloaking your affiliate links, I want to take time to emphasize the importance of disclosure to your readers. Not only are you legally obligated by the FTC to disclose any advertising and affiliate components, it’s really just a decent thing to do. Some people are comfortable with the thought of not informing their readers when they benefit from their purchases, but with my emphasis on transparency and honesty, I think it’s essential to building and maintaining the trust of your readers. That is why it is important to disclose these relationships at the BEGINNING of each post. Waiting until the end of the post to disclose sponsored opportunities or affiliate links is a way to look compliant while still not being upfront. Many people don’t even get to the bottom of a post and I know personally when I do and see that a post has been sponsored, I get annoyed. I have nothing against sponsored posts or affiliate links, but I feel like it is deceptive. Ok, end rant. As in the example above, affiliate links are often long and ugly. Changing your link to one that is associated with your site not only looks better, but readers may be more likely to click on it. If you have a long, complicated link to a site that the reader is not familiar with, he or she may be less likely to click on it and leave your page. If you do any email marketing that includes affiliate links, cloaking them will help prevent the emails from being noticed and diverted by spam filters. I am a member of a number of affiliate programs. I don’t use the links that often, so when I want to, I have to sign into each program, find the link I want, copy, and paste it. Sometimes I can’t even remember which product goes under which network, so it becomes a trial and error of logging into each one and finding what I’m looking for. Yes, I could just be a little more organized, but I haven’t put the time in since I don’t do a huge amount with affiliate links. The program I use to cloak my links is called Thirsty Affiliates and it is a free plugin from WordPress. There are ways to set up cloaking on your own without a plugin, but I am nowhere near that technical. If you are, check out Google and there are plenty of instructions. All of my links are stored so that if I ever want to use them again, I simply search within WordPress rather than having to search, copy, and paste from the internet each time. Another benefit is that if an affiliate link ever changes, you can simply update your link in WordPress with the new one and that will automatically replace any past posts with the updated link. For example, if you have been recommending a pair of running shoes for years and the link changes, by updating it through Thirsty Affiliates, all of your old post links will now have the correct link. I’m surprised with my criminal and manipulative brain that I didn’t realize this on my own, but by providing your naked affiliate link you are making it tremendously easy for someone else to steal your commission. By simply deleting your affiliate code within the link, someone else is able to then implant his of her affiliate code and get credit for a sale that should be yours. To me, it always kind of felt like I was giving out my home address by having the entire link visible. As I mentioned in my post about nofollow links, you are also required to mark any affiliate links as “nofollow.” This means that when search engines crawl your site, they will skip over those links. Having too many affiliate or sponsored links can result in a penalty from Google, so it is in your best interest to make sure they are “nofollow.” While you can do this manually, it can be time consuming and you may forget to if you don’t use them often. Thirsty Affiliates allows you to either check a box which makes your link nofollow or you can set it up in the main settings to always have them be nofollow. If you have any other questions about cloaking your links or I’ve left anything out, don’t hesitate to let me know! Are you cloaking your affiliate links? Learn how and why it could benefit you! DEFINITELY coming back to this one. I went through a no followed a bunch of posts, but it would be way easier to do it for links. I occasionally use Amazon affiliate links but I haven’t really mastered the art of using them. I need to get a handle on the no follow thing – it’s going to be my weekend reading! Thanks for sharing all this useful information. I really need to look into this opportunity further. Anytime! Let me know if I can help you out with anything! Understanding all the terms and business of blogging can be overwhelming, thanks for the detailed information! Thanks for sharing, this is really helpful! Dang gurl. I needed this. I’ve heard of Thirsty Affiliates, but that they can save them for you?! Freaking amazing! I know! It saves so much time! Super cool post! 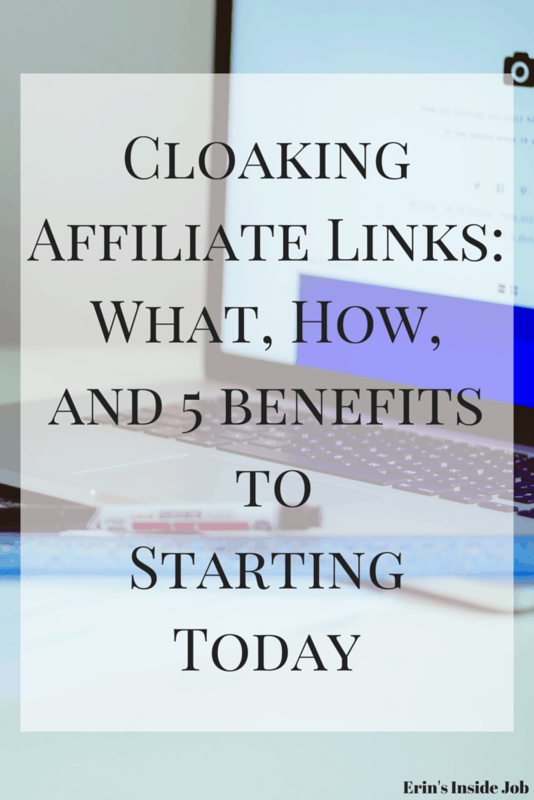 I had no idea about cloaking affiliate links (actually I am still learning about them in general)! I am definitely going to check into thirsty affiliates. I go crazy and start reading everything on the internet and then voila! Random blogging post! Commission theft? No freakin’ way! I never thought about that. Adding affiliate cloaking to my weekend to-do list. Keep sharing what you learn! I know right? I definitely will! You’re such a PRO! I really need to bookmark this.